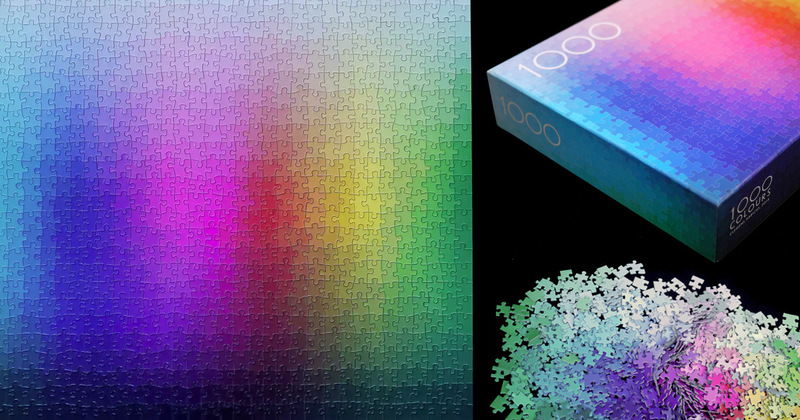 Australian artist Clemens Habicht has created the beautiful “color puzzle” pictured below, a puzzle containing exactly 1,000 colors cut into a one-thousand piece CMYK color gamut. You can order one here (via Colossal). I think it’s interesting that although there may be 1000 colors here — and the square-root of 1000 hues (left-to-right) or about 31 “distinct” hues, at least digitally, our eyes group them into 6 to 8 hues, with a couple of these being definitely minor or sub-hues. It says that the linearity (or geometric progression, as I do not know how this grid was created) of digital color reproduction does not match up well with the unlinearity of our eyes. What would it take, mathematically, to make a color scale that had as smooth a gradient as a sunset? Those are fascinating observations. Also, when I see a “red patch”, do you see the same color as I do? I hate to say it Enrique but my left eye does not see the same color as my right eye. So the answer to your question is unquestionably no.